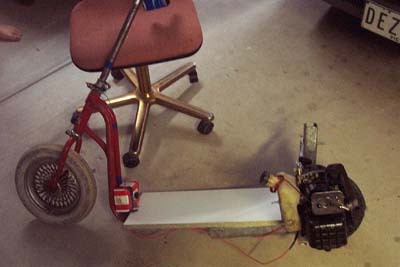 This scooter was a short holiday project that speeder and I Attempted to build. 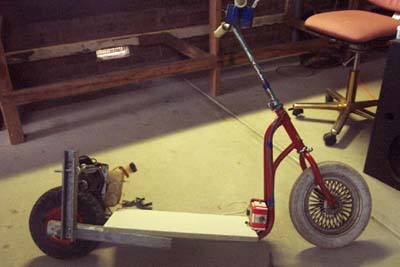 The scooter frame is an ancient piece of junk which could barely hold anybody's weight. 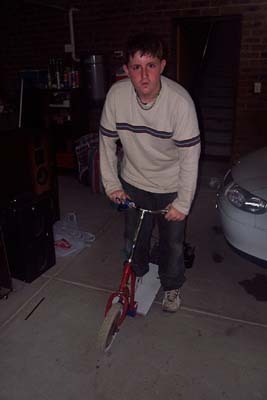 We were really strapped for cash and we coudn't really afford a good scooter frame to mount it on! We had a fat 10inch wheel (I think) lying around, so we put use to it. We extended the back using electrical "Uni-Strutt" And M8 high tensile bolts. THE UNI-STRUTT WILL PROBABLY BREAK BEFORE THE BOLTS WILL!!! 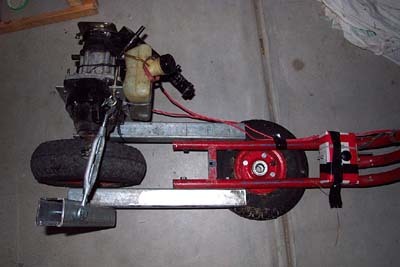 The engine had a sprocket welded onto it from a previous attempt to build chain driven scooter. The sprocket had a hub and a sprocket part (part with the teeth) The two were held together by a "circlip". 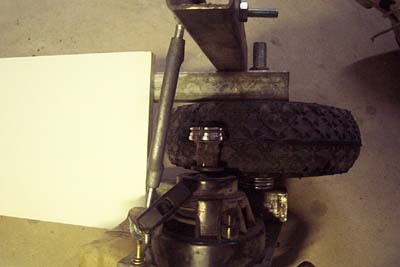 We just simply removed the circlip and used the hub as a spindle. 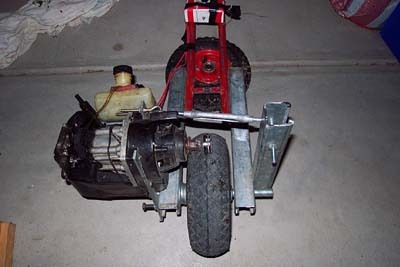 Future improvements are, proper accerlerator handle , a bike peg spindle and a bigger fuel tank. The engine was picked up off the side of the road on hard rubbish collection and restored to working order by me. It has reasonable acceleration on a flat but hills are a bit of a problem. I am trying to get my hands on a chainsaw engine.